Let's face it, catering a whole meal for fifty, a hundred people, a few hundred or more can add up quickly. Budgeting can seem daunting when you think about the appetizers, salads, soups, entrees, desserts, drinks and the overall service. Combined they create a memorable, delicious event – but they can also hurt your pocketbook if you aren’t careful. The good news is, there are a variety of ways for you to minimize costs without chopping off substantial portions of your meal. Here are 5 ideas you could incorporate into your next catered event. Check with your caterer to see if there is a significant price difference between serving plated meals and having a buffet. For a variety of reasons, plated meals are generally more costly than a buffet. This is due to preparation and serving time, as well as the difference in ingredients used to make the dishes. Plated meals add elegance and grandeur, but if your event doesn’t require these sentiments, you can save money by choosing a buffet-style meal instead. 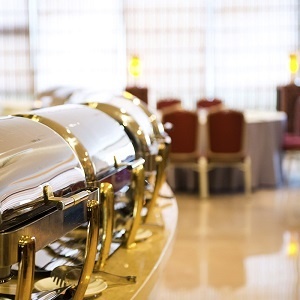 If timing isn't an issue for you, consider moving your event to lunch even breakfast time. You will find that breakfast and lunch generally cost less than dinner. Events held during earlier time frames can break up the day (especially those held during the week) and leave your guests’ evenings open for their personal or family events. In recent years, it has become trendy for people to serve appetizers, rather than full meals. If your event is more social in nature, where it is appropriate for people to talk and mingle, then serving appetizers will make more sense than having people sit down and eat. They are easy to eat while conversing with peers or friends, plus you don’t have to plan your event around designated meal time, which adds some flexibility to your agenda. Footing the bill setoff an open bar can set you back thousands of dollars. Simply skipping the open bar and limiting the free alcohol to wine and beer can save you a significant amount of money. This way guests looking for alcohol still have two great options. And, if you’d like to provide your guests with the choice of other drinks, then opt for a cash bar. This way you share the cost and still provide the atmosphere of having a bar for your event. If you have the time and/or the help, then baking, cooking and concocting your own dishes can be a great way to save some money. This is particularly helpful for items like salads, desserts or soup, which don’t involve long preparation times. As you can see, there are a number of ways to cut costs if you are catering on a budget. Explore your options and work with your caterer to ensure you get more bang for your buck.